Here’s more information about the music and performers on The Main Street Sessions airing Saturday, March 1, 2008 at 2 p.m. To compliment Ken Frazelle’s new set of songs, Vanishing Birds, images of and information about the extinct or endangered birds described in his music is included below. Carolina Paroquet (Conuropsis carolinensis) – Duke specimen #B831, from GM Gray’s collection, collected in Florida, no date. 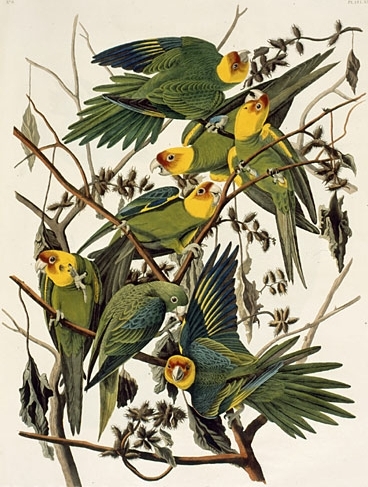 The Carolina Parakeet died out because of a number of different threats. To make space for more agricultural land, large areas of forest were cut down, taking away its habitat. The colorful feathers (green body, yellow head, and red around the bill) were in demand as decorations in ladies’ hats, and the birds were kept as pets. Even though the birds bred easily in captivity, little was done by owners to increase the population of tamed birds. Finally, they were killed in large numbers because farmers considered them a pest, although many farmers valued them for controlling invasive cockleburs. In the mid-l800s, naturalist John Audubon reported that the Red-cockaded Woodpecker (Picoides borealis) was found abundantly in the pine forests of the southeastern United States. Historically, this woodpecker’s range extended from Florida to New Jersey, as far west as Texas and Oklahoma, and inland to Missouri, Kentucky, and Tennessee. Today it is estimated that there are about 4,500 family units (groups) of Red-cockaded Woodpeckers, or 10,000 to 14,000 birds, living in clusters (groups of cavity trees) from Florida to Virginia and west to southeast Oklahoma and eastern Texas, representing about 1 percent of the woodpecker’s original range. The bird’s name is derived from its plaintive bell-like whistles which are often heard before the bird is visible. This bird is endangered and its range has reduced recently due to habitat loss and human activity near nesting sites. Some critical nesting habitat is now protected. In coastal areas such as Cape Cod, beach access by ORVs is prohibited near nesting piping plovers – a cause of some conflict over the years – as a result of management plans. In Eastern Canada, the Piping Plover is only found on coastal beaches. In 1985 it was declared an endangered species by the Committee on the Status of Endangered Wildlife in Canada. In 1986 it was declared to be endangered within the watershed of the Great Lakes and threatened in the remainder of its range in the United States, which resulted in the permanent closing of Moonstone Beach in South Kingston, Rhode Island.